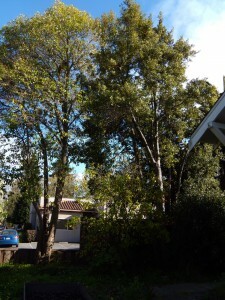 Earlier this week the city cut down an old Valley oak in our neighborhood. It’s a tree I walked past as a child and one that I have always loved. Turns out it was well over 350 years old. I know, of course, that there are plenty of species that live far longer than this, but somehow I can’t get over the fact that a tree in the place I call home grew up in the 1600s, that it shaped this landscape even as the land around it went from open oak savannah to suburban lawns and asphalt. Lawns and asphalt, incidentally, are probably what compromised its health to the point that, even with all its vibrant spring growth, the city felt the need to limit liability and cut it down. Kelly and I sat on the curb under its leaning trunk and talked to it in our hearts the night before it died. We went back the next afternoon and touched the great, oozing rounds of it that the city left behind. And we pulled out soft white sponges of oak root fungus (Armillaria mellea) from the tree’s core and smelled the yeasty sweetness. We are lucky. There are probably dozens of giant old Valley oaks in our immediate neighborhood. They are stunning and majestic, and they are holy to me. Most of them are planted in the middle of irrigated lawns, or crowded next to sidewalks and driveways. There aren’t many young trees, at least not ones that will have space to grow. I have watched the Valley oaks slowly going over the course of my small human life, taken out by the city or falling on their own. It has always nagged at me that there is no longer space in this suburban landscape for Valley oaks to thrive and reproduce. But there’s something about losing the tree this week that has lit a fire in me and broken my heart, all at once. Maybe I will nag the city to start replanting trees from local stock. Maybe I’ll go door to door imploring neighbors to stop irrigating lawns at the bases of these drought resistant trees, to take out paving, to make space. The second death this week is also heartbreaking. 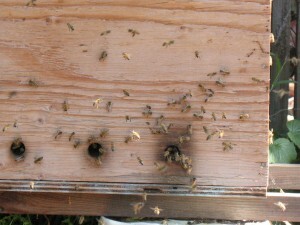 Kelly and I went outside today and noticed that no bees were flying into Mondo, our beloved three-year-old top-bar hive. We got underneath and looked up through the screened bottom with a headlamp. 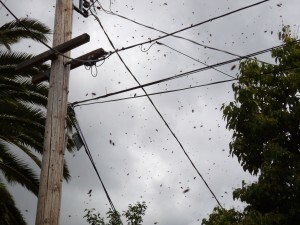 There were a handful of zippy, agitated bees, but no group in sight, no rumbling hum of a healthy hive. As usual, Mondo built up beautifully this spring. They swarmed at least once last month. All we can figure is that their new virgin queen got lost on her mating flight. Of course, we could always be wrong. Perhaps they swarmed a few more times when we weren’t looking and are still waiting for the new queen to get up and running. But it doesn’t look good, and we’re fairly certain they’re gone. We have other great bees, but Mondo’s line was our favorite and our longest-lived survivors. 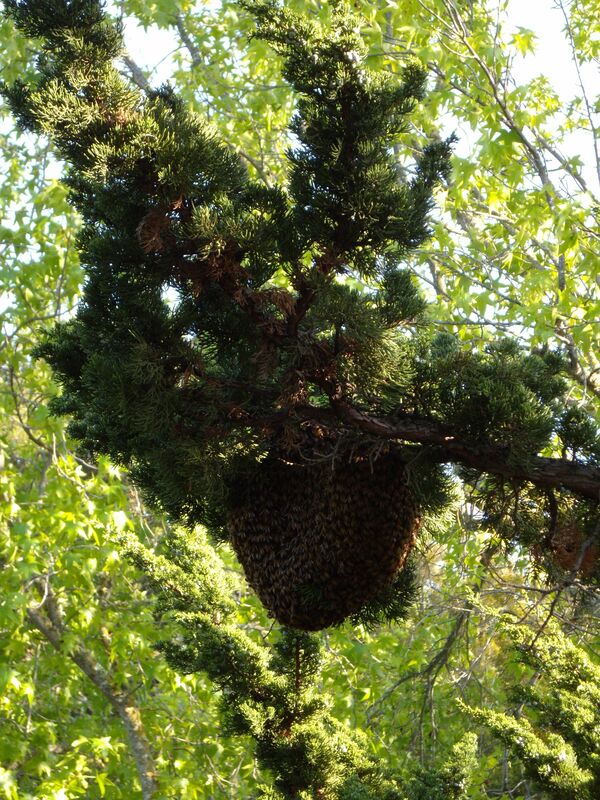 To make matters worse, Juniper, Mondo’s first swarm from last year, is our only other hive from this lineage, and she isn’t looking great. Although she built up well coming out of winter, we’re not aware of Juniper swarming yet, and she seemed to slow way down in March. There is a pile of dead bees in front of Juniper that we think have deformed wing virus. About an hour after discovering Mondo’s troubles, we got a call from some friends who live just two blocks away. 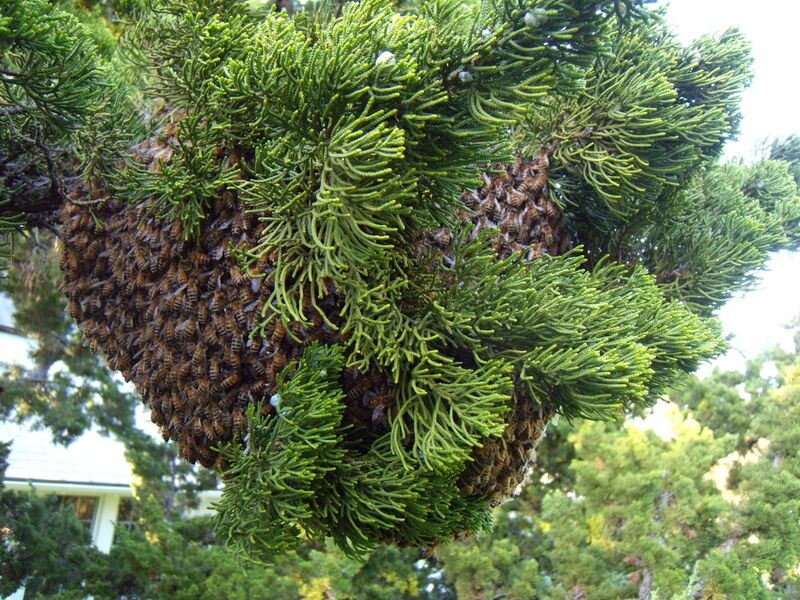 They reported that there was a swarm in their front yard, and asked if we wanted it. 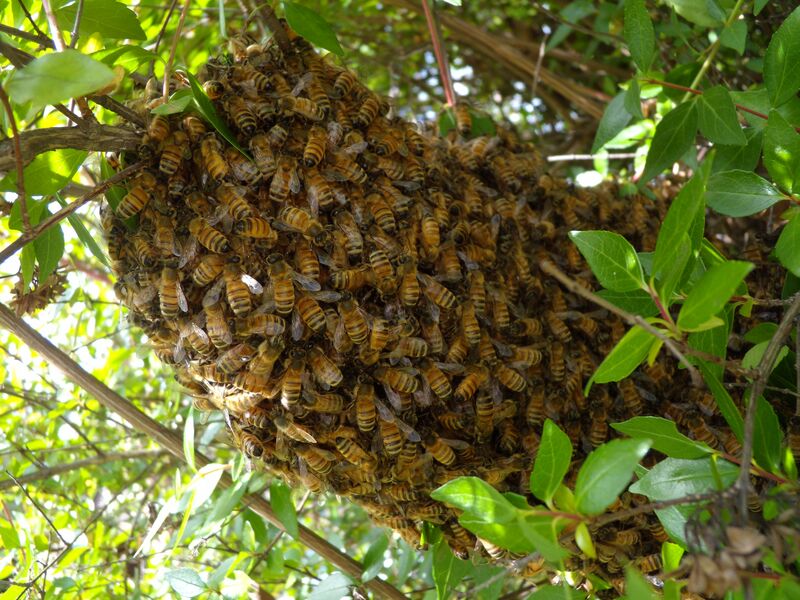 We jogged over in our bee suits, and there it was: a beautiful, mellow, good-sized swarm about three feet off the ground in a shrub. This never happens to us. 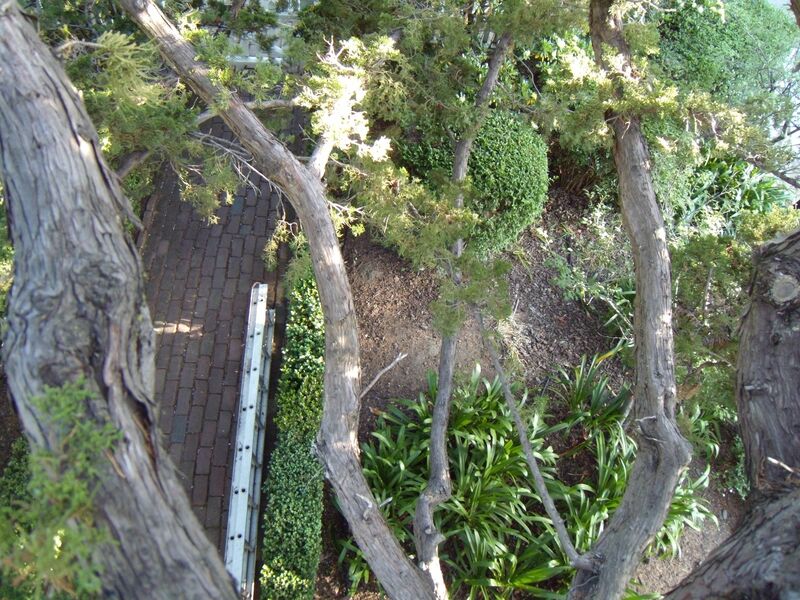 We are used to swarms high up in trees on perilous branches. We’re used to swarms with eight queens and thousands of worker bees that can’t figure out where their allegiance lies. 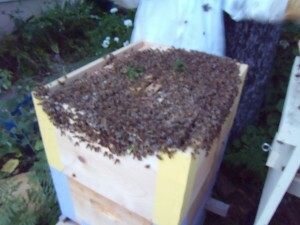 We’re certainly not used to swarms that march docilely into a box that you place just below them. 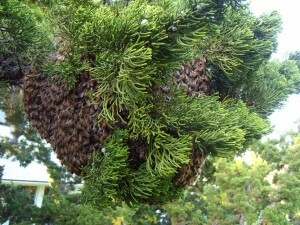 Even Kelly, who has sworn off beekeeping with all of its stresses and unpredictability, was excited about this swarm. 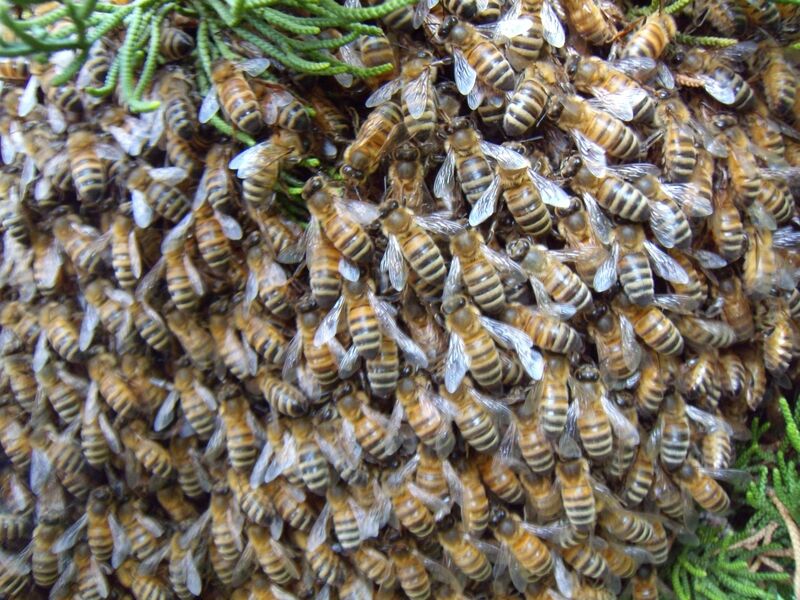 We wondered whether there’s a little bit of Mondo’s genetics in these bees, or if they came from the cavity in the old Valley oak that stands next to the one that was cut down. We wondered if they are exactly what our hearts need. In my ongoing love affair with gardening, I occasionally stop to ask myself why I care so much. Why does gardening bring me so much joy, and why do I feel so passionately that it matters? I know I’m far from alone in being overcome by the seductive power of growing food. Take one look around the Internet, and you turn up blog upon blog about edible gardening, urban farming, and local eating. I’m also sure that each gardener and backyard farmer has his or her own reasons for producing the ultimate in local fruits and veggies. For some, I think, the motivation is a deliberate, rational desire to cut costs and raise one’s own standards of eating. For others, it is a moral calling—a drive to walk the walk of one’s green living ideals and follow a gentler path on our overburdened planet. Finally, there are those for whom the call of the asparagus bed is more akin to a spiritual journey; both literally and figuratively, gardening can ground us, connect us, make us feel alive and touched by the divine, bountiful world. Today is Overall Gardener’s second birthday. 2014 is young and still full of possibility. Solstice is behind us, and the light is returning (if only the rains were, too). In the darkness before this year’s planting of seeds, I feel moved to not only reflect more on a topic I already enjoy immensely, but also to push toward a better understanding of why growing and gathering food for ourselves really matters. In doing so, I hope I can better advocate for these most important of human activities. No, really, I’m not just being dramatic; I think it matters that much. 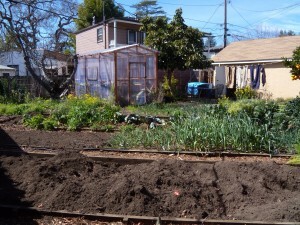 Edible gardening and urban/suburban farming have become awfully fashionable in America. While hunting for a book on home distilling for Kelly before Christmas (egad—how very illegal! ), I perused the gardening/home brewing/green living sections at a number of local bookstores. Without exception, they were chock full of books on growing your own food, making the most of small gardening spaces, transforming city lots into productive mini homesteads. These books are filled with sleek pictures of perfectly designed urban farmscapes. They make me all quivery and melty inside. 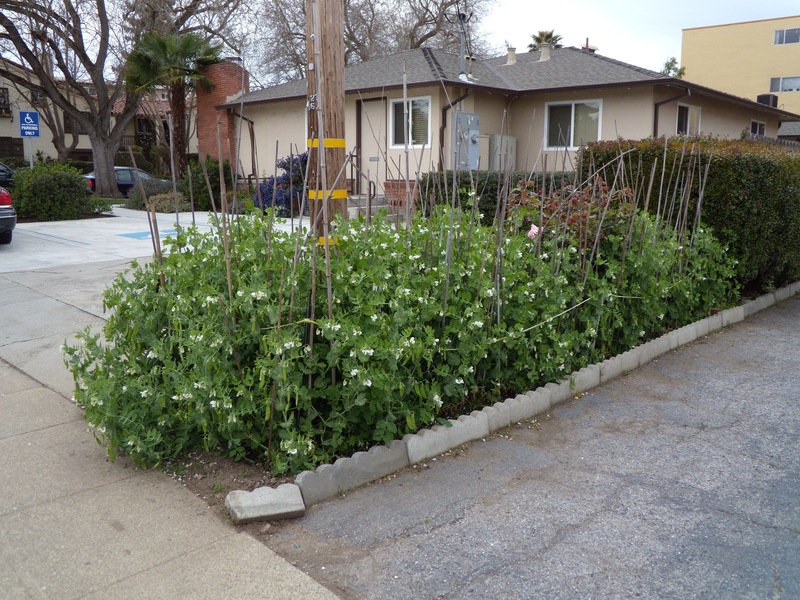 But while there is undeniably a craze for super-local urban farming and food gardening, it’s difficult to find anyone growing food in their front yard. In effect, as much as we pledge our love for edible gardening and our commitment to personal food production, this is still an activity to be kept discreetly out of sight. 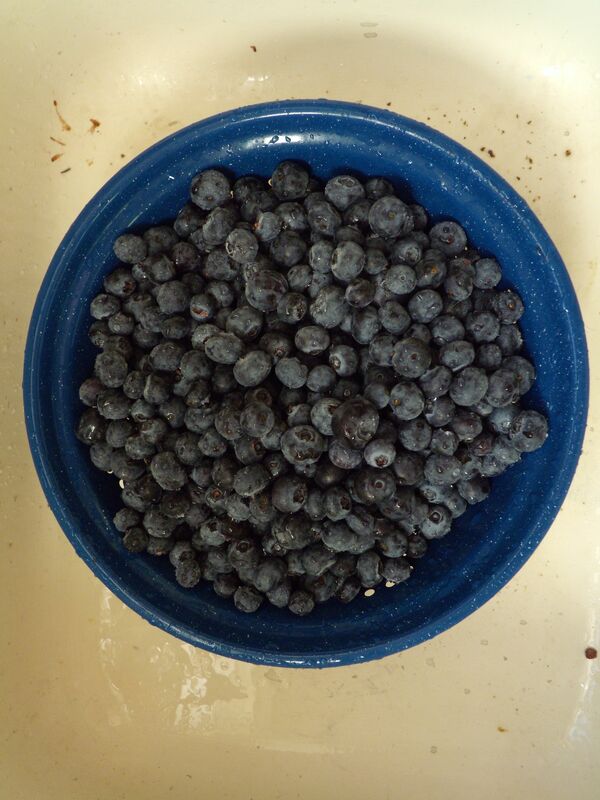 Are we afraid someone will steal our blueberries (Kelly is)? Are neighbors’ judgments, local ordinances, and HOA rules dissuading us from getting down and dirty with curbside artichokes? In many cases, unfortunately, yes. But I think there is also a way in which many American city dwellers just haven’t made that cognitive and cultural leap. Gardening is great. Homegrown melons are fabulous. But lawns and birch triads and privet are comfortable and orderly and proper front yard fare. Sadly, my front yard faces north. Add to that Kelly’s love of ornamentals, and you have the reason why our front yard is no edible jungle (and why we haven’t been able to agree on what to plant there and have left it barren and sheet mulched for two years now). But there is adequate curbside light for artichokes, a sunny spot I’ve wrangled as a future site for five blueberry bushes, and a 15-gallon ‘Wonderful’ pomegranate waiting patiently by the garage. I think it’s important to grow food where passing strangers can see. 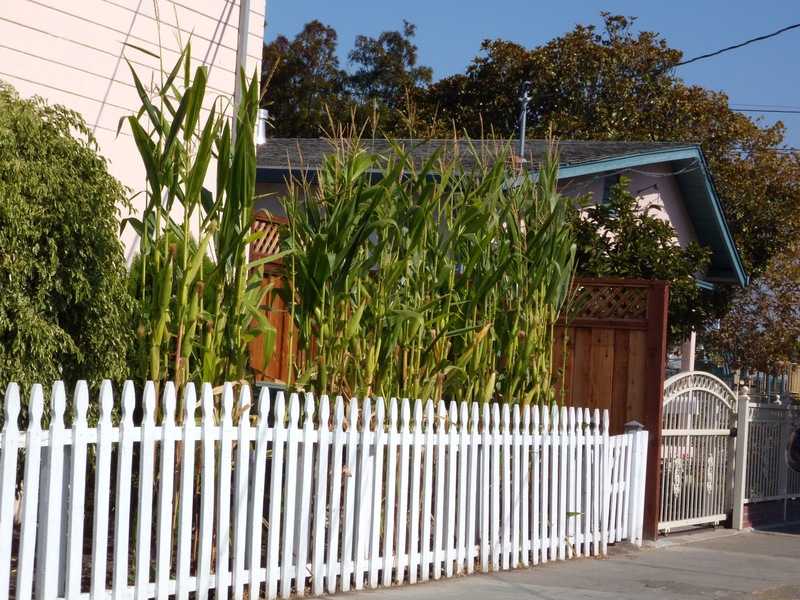 I want my neighbors to know that I grow food proudly, and I want them to think about what they might grow on their own piece of earth—be it a sprawling backyard, or the narrow patch of dirt in front of an apartment. I think food is beautiful. I think gardeners everywhere need to get up their gumption, throw caution aside and do their lawns in. Imagine what your town would look like if this happened. Imagine all the food people could produce if they stopped limiting themselves to backyards. 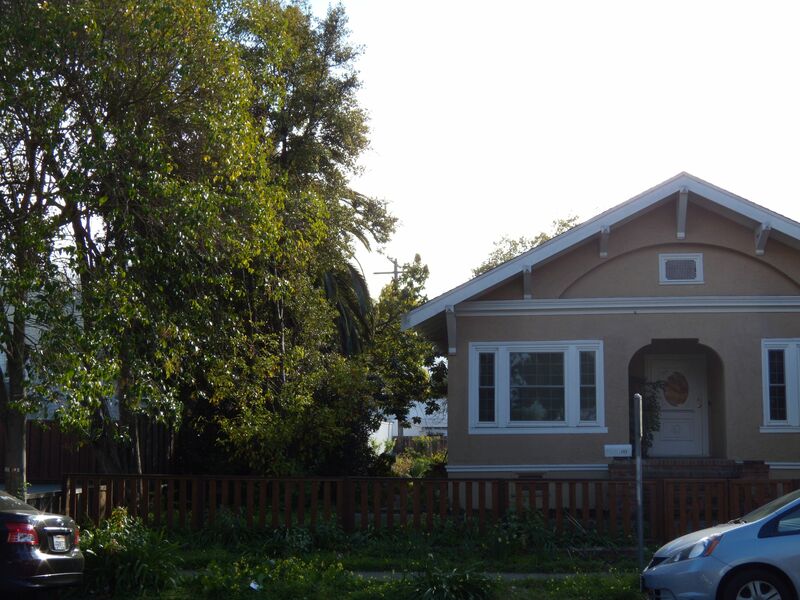 Imagine how much more interesting your neighborhood could be. Several years ago, I resolved to photograph front yard food gardens. Where are these gardens, I wondered? I spent an afternoon driving through my town and those adjacent to it. It’s upsetting how little food you see in my area when you do this. Citrus is just about the only acceptable front yard crop, apparently. I have to add here that I live in California’s Silicon Valley—an area where wealth, status, and image are paramount for many. Squinting from behind the wheel, I occasionally spotted a raised bed, or apple tree, or bean teepee, and I would slam on the brakes and start snapping pictures. These gardens didn’t, generally, look like the pictures in those snazzy urban farming books. They were imperfect—weedy, vegetables past their prime, hose left in a tangle. Some yards sported lawns edged with tomatoes and peppers. 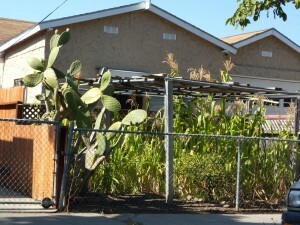 Some yards were bare dirt with one sprawling squash plant. But they were useful and beautiful in their own right. Just when I was beginning to despair at how few people let their gardens loose out front, I crossed over to the ‘poor’ side of town and found a different world. Front yard edibles still weren’t the norm, but they were more common. 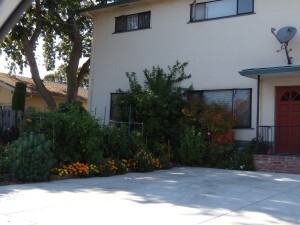 In a single block I found three cramped front yards overflowing with produce. 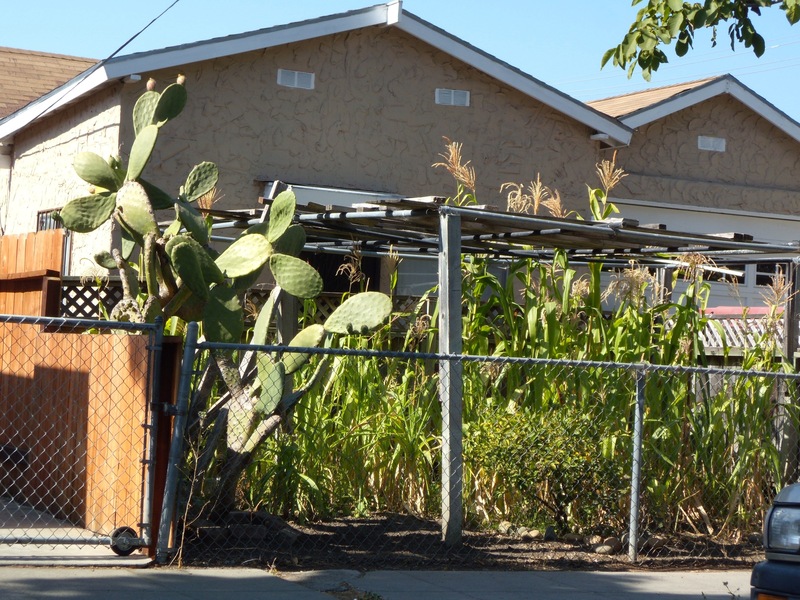 Here there was corn and prickly pear cactus, squash peeping from behind a chain link fence, apartments with tiny gardens between stairwell and sidewalk. I won’t pretend to know all the reasons behind these gardeners’ efforts, though it would be tempting to venture that they garden from a combination of necessity and cultural values brought with them from outside the inhibited American gardening mentality. Why do we garden? Why does it matter to us—especially when so many of us live hectic lives and have access to good fresh produce from grocery stores, farmers markets, CSAs? Urban farming is not just the property of upper-middleclass professionals browsing bookstore shelves and consulting specialty landscape architects. And, lest I sound too judgmental or self-righteous, urban food growing no more belongs solely to the urban poor. Food gathering and cultivation is each of our birthright, and it’s in our blood. Growing food is nothing new, but our relationship to it is. In 1900, 38% of the American work force farmed. By 1990, only 2.6% of Americans made their living farming. It’s also true that agribusiness has radically altered farming, but the statistics are depressing nonetheless. In a few generations we have literally forgotten or abandoned essential knowledge that our grandparents and great grandparents held dear. Growing up, my grandmother was the fastest prune picker of her seven siblings. I’ve never eaten a prune, let alone grown and picked one. My grandfather was a nurse, not a nurseryman, but he still knew how to graft fruit trees. At no point in human history have we lived lives so disconnected from our sources of nourishment. Surely this at least partly explains the visceral delight so many gardeners feel plunging their hands into rich damp loam, hauling a basket of onions in from the cold, spotting the first tiny growth that pushes up after planting seeds. And maybe we haven’t really forgotten at all. Maybe this is why so many of us still come home from a day at the office, turn off the computer, and head outside to weed the beets. I’ve never been much good at sharing, but Kelly and I recently decided to welcome a garden sub-letter of sorts to our little farmstead. Matt, our back-fence-neighbor, was on the hunt for gardening space. Specifically, he is eager to grow hops, kale, scarlet runner beans, and tea. How could we not get excited? Matt’s new garden plot is the second open bed from the foreground. In exchange for dirt, sunshine, water, and a corner of the greenhouse, Matt has agreed to put in five hours a month helping out with garden projects (translation: weeding Bermuda grass). We are thrilled to have him around. Since we are reclusive, uptight types, we have created an elaborate schedule for Matt’s gardening forays which takes into account his night shifts and our lazy mornings in pajamas. We trust it will all work out, and we are eternally grateful to him for putting up with our chickens’ egg-laying squawks during his sleeping hours. Matt, if you’re reading this, we are sooo appreciative of your flexibility and good humor. The process of deciding to share our garden with another human has been an interesting one. We’ve considered the idea before and always shied away. Gardening is intimate and personal. The garden is where we meditate–unofficially, while pulling weeds—and where we find artistic expression. It offers comfort and solitude and the opportunity to connect with the natural world and to actively participate in it. But gardening is also about community. It is an acknowledgment of our human needs for nourishment and our age-old connection with the landscapes we each call home, and with each other. We have a big garden (at least for two city dwellers) and Matt lives in an apartment with one north-facing balcony overlooking our chicken coop. The match seems preordained. Add to that that Matt is uncommonly polite, sensitive to our slightest prickle, and genuinely enthused at the prospect of training hops up onto his balcony railing. Of course, we have always shared our garden. With the squirrels and raccoons. With the titmice and towhees. With the crimson throated hummingbirds and carpenter bees. 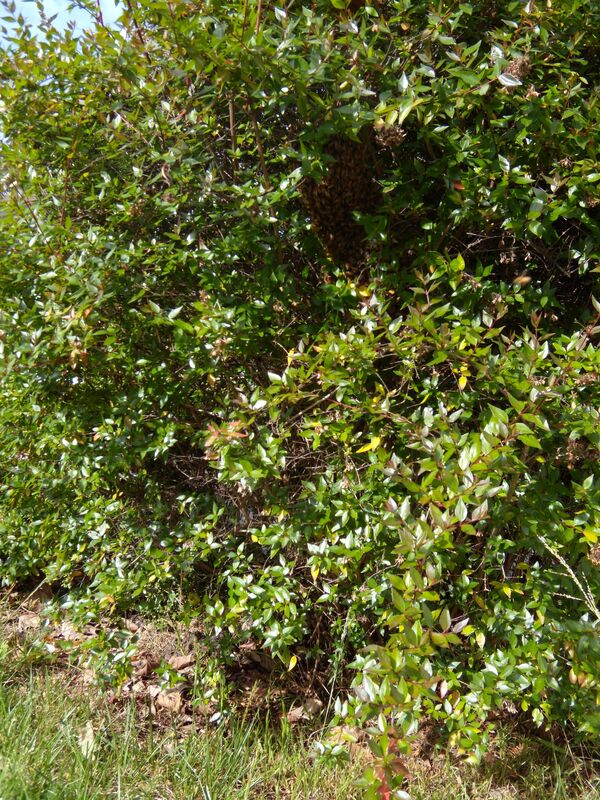 Sometimes, in our quest to conquer weeds and tame shrubs, we forget these other residents. 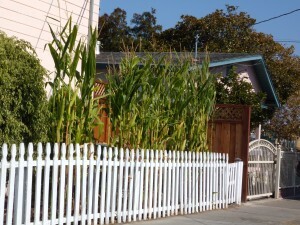 I have a thing for growing food and a tendency to turn up my nose at Kelly’s ornamentals and California natives. Had I been born a few hundred years earlier and made the trek west across the United States, I strongly suspect that I would have worked with dedication to eradicate any native fauna that dared to compete for my crops or game and would have steadfastly worked to clear land of offending native flora. I’m not proud of this, I guess. It’s just that, on some level, I want so badly to survive that it seems like a crime not to utilize every inch of the garden for human life sustaining crops. Which leads me to our latest dilemma. We’ve been lobbying the landlord for years to remove several weed trees in the front yard to allow us more room and light to plant interesting things. Now, suddenly, the gears are in motion and removal is set to start on April 2nd. Kelly came to me forlornly the other day and asked about the towhees. Don’t they love that spot in amongst the sick laurel’s suckers? Isn’t it shady and cool for them in summer? Might they nest there, hidden where we’ve never seen? The two trees in question: privet on the left and laurel on the right. Apologies for the dark picture, but that’s kind of the point. We sat in the front yard for a long time and watched the sun move behind the laurel, the front yard destined to shadiness for the remainder of the day. I waded into the suckers and tried to really imagine the front yard without this towering tree. And of course, I felt guilty. We’re not the only ones counting on this garden for sustenance—in fact, we have far more options than our non-human neighbors. Where will the towhees go if the tree comes down? Will the garden start to look like someone else’s? For all my efforts to mulch the weeds into nonexistence, I’ve realized in the past few days that my image of the garden includes large swaths of unruly weeds. I’ve never been intimately involved with an immaculate, well-kept garden—and maybe I don’t want to be. 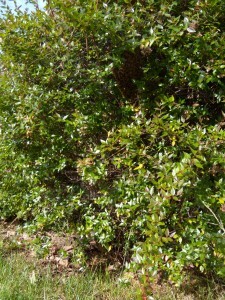 Anything we plant in the space the laurel and privet now inhabit would ultimately provide habitat. 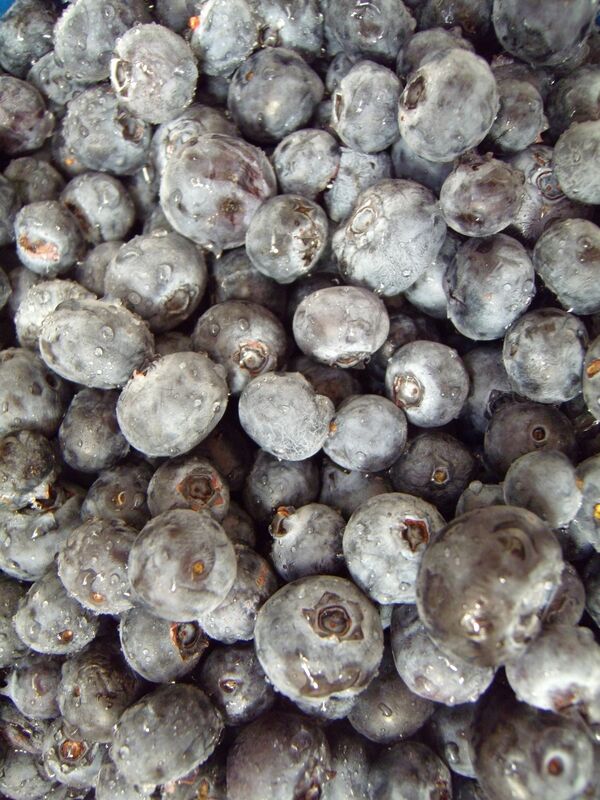 We’ve talked about pomegranate and currants, lavender, artichokes, and redbuds. But the fact remains that wiping the slate clean will change our garden landscape and impact the lives of countless local critters on every scale. How does one make a choice like that once one has become utterly bogged down with the inherent ethical questions? What, exactly, is a gardener’s place? Overall Gardener on Twitter??! Ack. I love to garden, and I love to write, but technology and social media are not really my strong suits. So it was with trepidation a year ago that I signed up for a Twitter account for the Overall Gardener blog. I believe I posted one tweet right away, before letting the account sit idly for over a year. What’s Twitter good for, anyway? I’m still not quite sure. Clearly, I’m not doing a great job of selling you on my brilliant gardening tweets, but if you are brave of heart and not easily bored, stop by. I even figured out how to include a nifty button on the right-hand side of the blog which you can click in order to “follow” my tweets. And better yet, drop me a line and point me in the right direction. Until then, I will be roughing it alone with the handle, @OverallGardener. Yikes, I never thought it would come to this. The combined queenless colonies are dead. 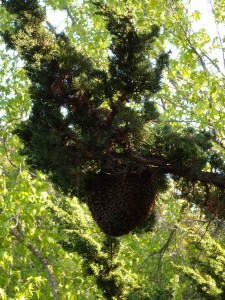 Despite reducing the hive entrance to discourage robbing, they were robbed silly by the other colonies in the neighborhood. 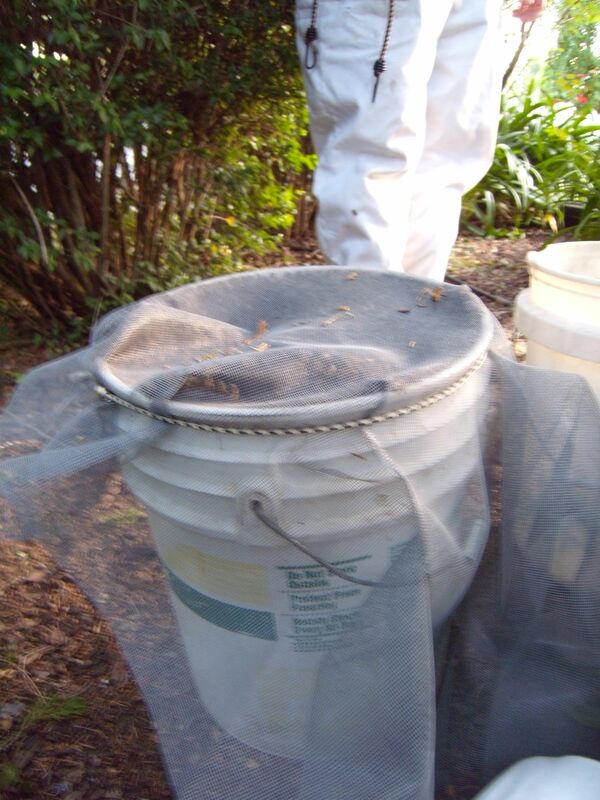 I suspect that the queen cell we had spotted and were banking on was dead before we combined the hives. At any rate, it never hatched. 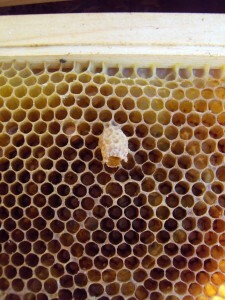 One of the previously hatched queen cells in Percy that must not have made it. You can see evidence of robbing at the top of the frame. 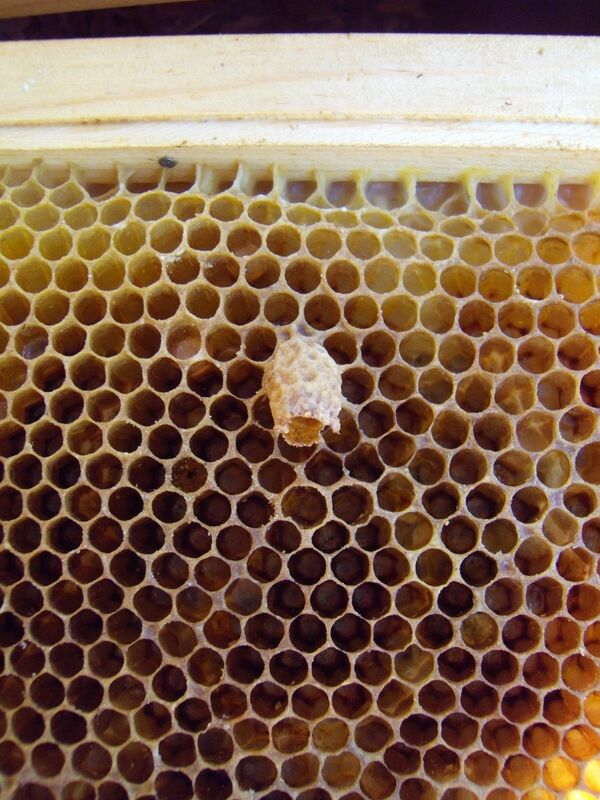 The robber bees chew up the wax to get to the honey, leaving it ragged looking. I discovered this today when I dismantled the hive. 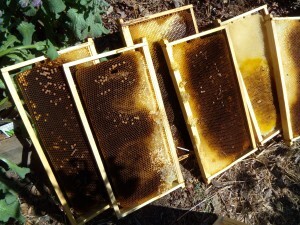 I also discovered that for some reason the neighborhood bees hadn’t finished the job of robbing; there was a fair bit of capped honey above the brood comb that I whisked away to the basement freezer. There were also earwigs and small hive beetles. I found them skulking in wax crevices, and they ran from the glare of the sunlight. A small hive beetle on a mission. Click to enlarge for a better view. So what happened to the queens? 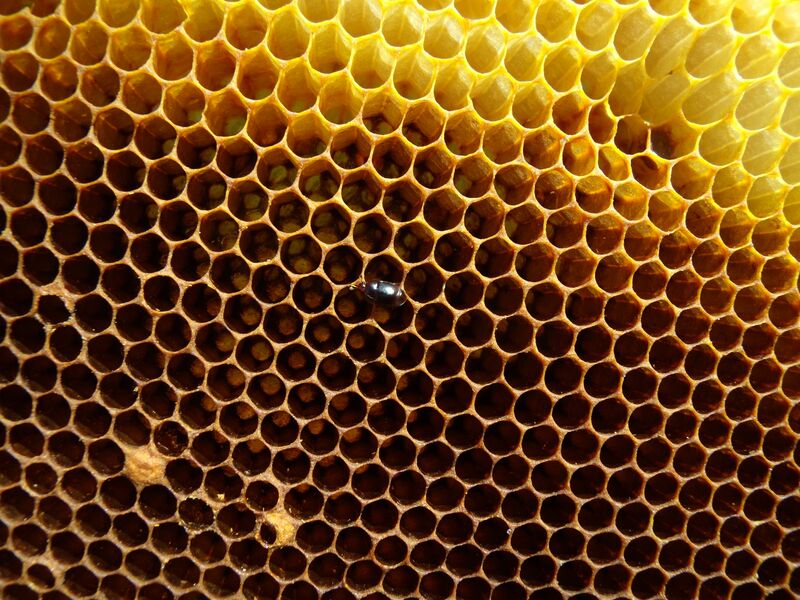 We don’t really know what happened to the queens in these two colonies. Percy was a good-sized swarm in early July, but its numbers started dropping quickly as the month wore on. To be honest, I think they might have been just fine if I had fed them. We are still ironing out our beekeeping philosophy. Kelly and I had a long conversation about whether or not to feed Percy and decided that, although we have always fed swarms in the past, this did not reflect our intention to let our bees fend for themselves. 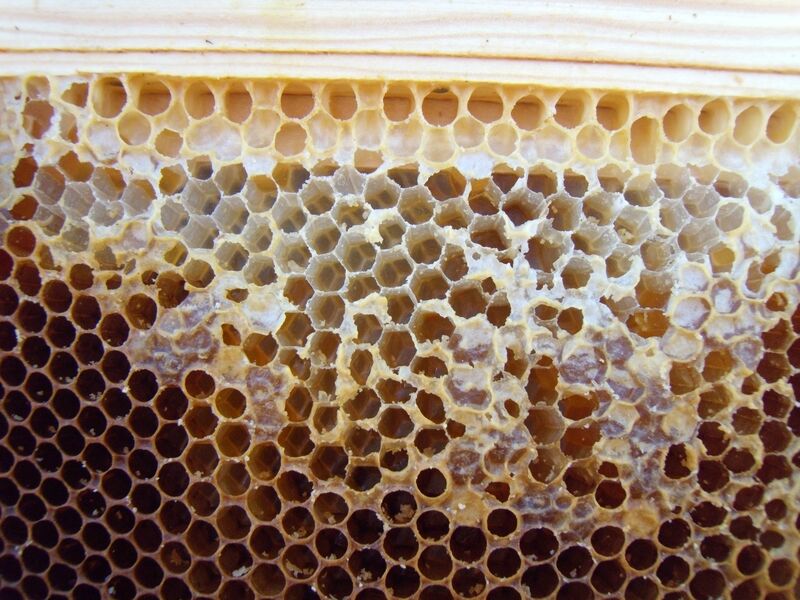 If a feral colony swarms late in the season and finds a tree cavity to move into there is no one refilling a jar of sugar syrup for them every few days. They sink or swim, and the continuation of their genetics depends on their ability to tough it out in whatever environment they find themselves. They are self-made bees. 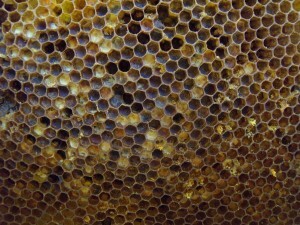 Granted, feral colonies don’t have to contend with a couple of clumsy humans stealing their honey, either. We are manipulating our colonies and changing the course of their existence. So where do we draw the line? What is too much meddling, and what is appropriate? If I had it to do over again, I would feed Percy. This is partly because I hate to see a colony die, but it’s also because I moved them about 14 miles from where they had swarmed. 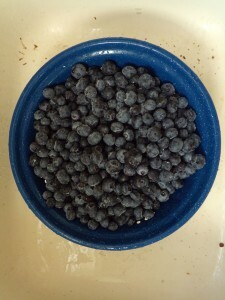 They arrived in my neighborhood relatively late in the season and with no geographical knowledge of where to forage. Maybe I’m making excuses for them, but it seems to me that this put them at a distinct, if temporary, disadvantage. The second queenless colony, April, started out as package bees this spring. They came from a bee breeder who supposedly takes special measures to ensure strong genetics. 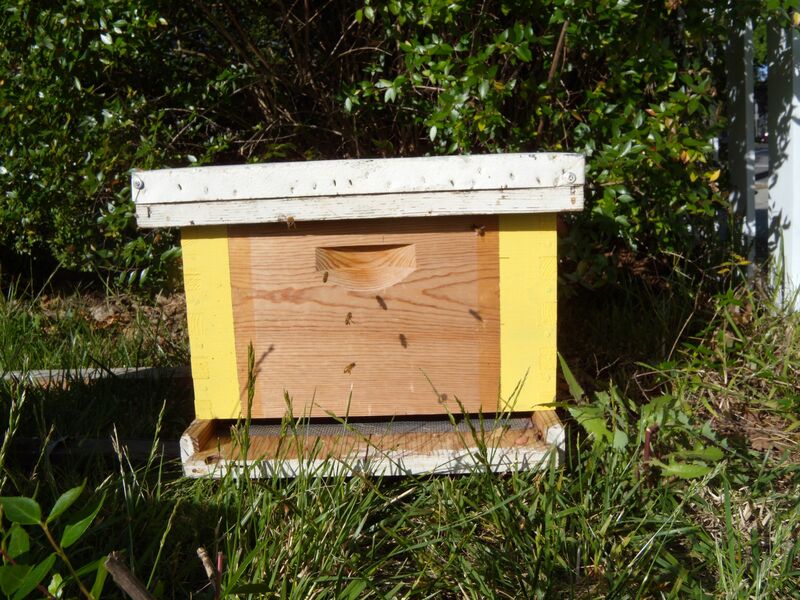 Specifically, she does not treat her bees and her packages contain queens bred from breeder queens that have survived at least two years. Unfortunately, the rest of the bees in the package are leftovers from almond pollination, leading me to wonder what diseases and pests they bring along with them. This colony never boomed, though its numbers were decent through the spring and early summer. Dismantling the hive, I found no signs that April had tried to rear a new queen after the demise of their matriarch. 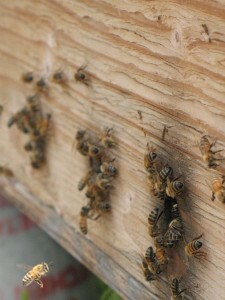 It’s possible that we rolled the queen (killed her) during one of our summer hive inspections. 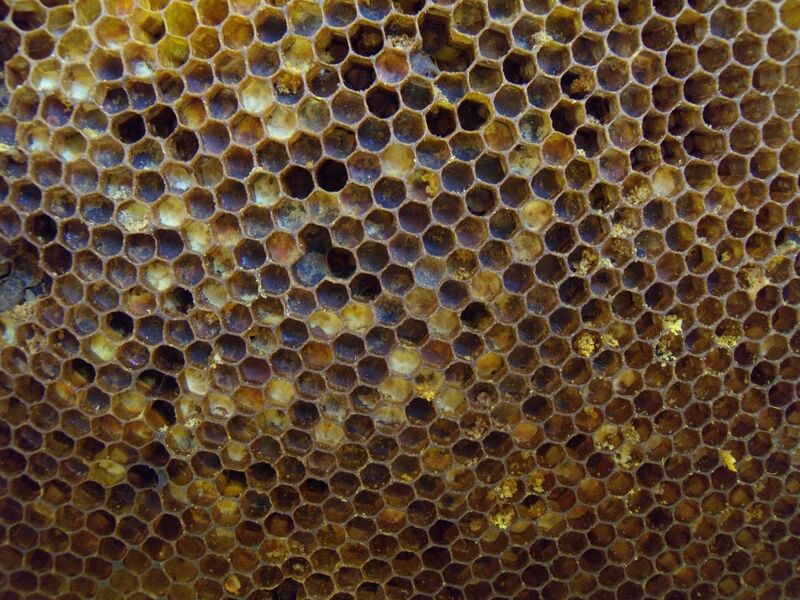 This doesn’t explain, however, why the bees would not have tried to raise a new queen. 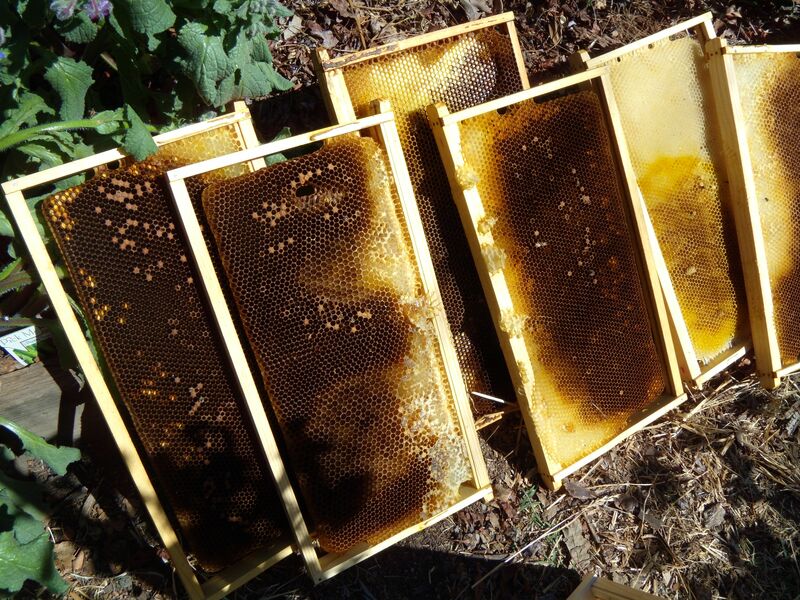 We used foundationless frames in April, and although there were some issues at first with cross- combing, the girls ultimately drew beautiful frames of wax with only the aid of glued-in craft sticks as a guide. 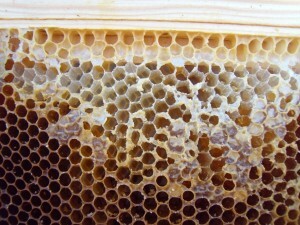 The dark wax is brood comb, while the light-colored wax at the tops of the frames was used to store honey. I’ve been thinking a lot about mortality recently and the often forgotten histories of places. My grandmother, born and raised on a California fruit ranch in the Santa Cruz Mountains, will turn 101 this June. I was fortunate enough to live with her for two years when she was in her mid-nineties and got to hear many of her stories about life in the country. We live just across the street from her now, and she sometimes comes to sit in the garden and watch things grow. An 82-year-old woman told me yesterday that she has a theory about heaven. She told me she believes that we have to find heaven in this lifetime, that all of our earthly blessings are enough, and that our lives are the heaven we deserve. She said that the finality of death only enhances the profound awesomeness of life. Amen, and yikes! 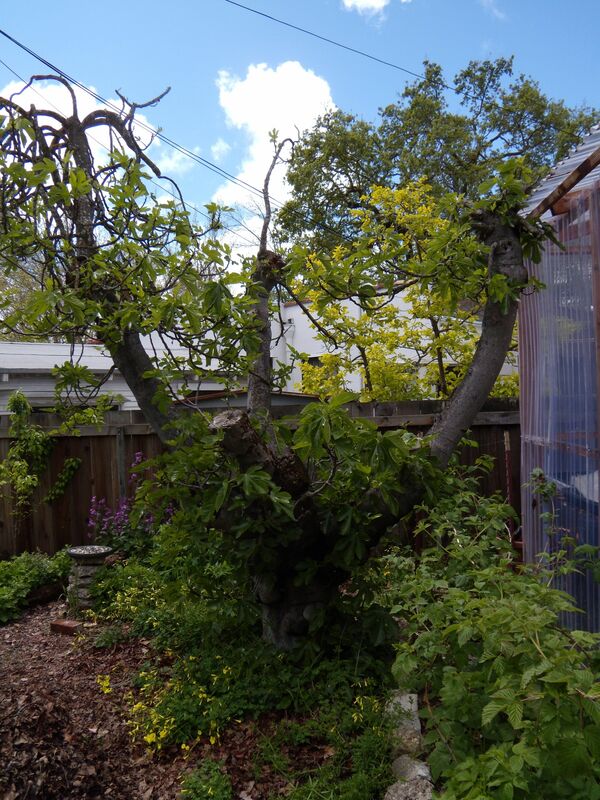 Last year Kelly set up her orchard ladder and pruned an old fig tree at the back of our garden. 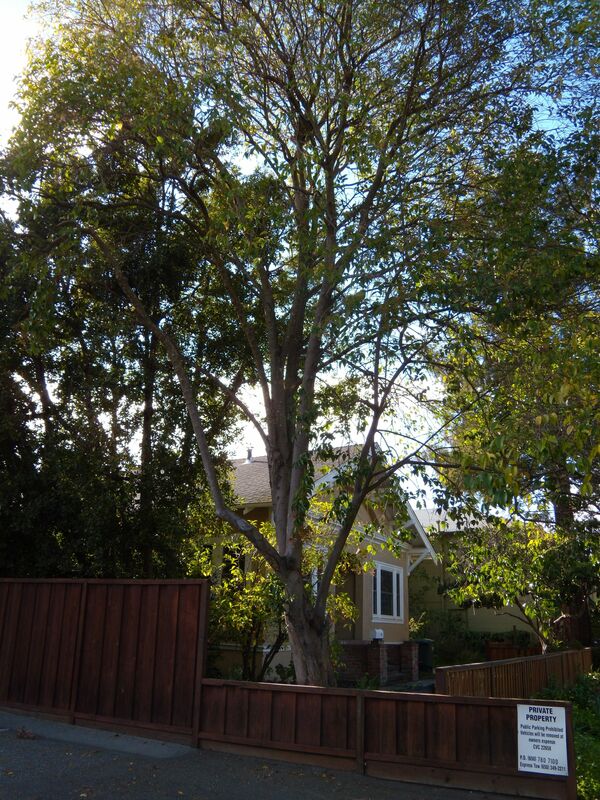 The tree is slowly dying, rotting from a bad pruning cut close to its center. 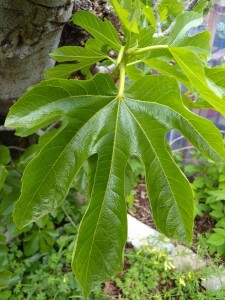 Still, it produced loads of delicious green figs last year, and it leafs out with the same delicate new foliage each spring. In her pruning of dead and dying wood, Kelly removed a large branch, and we noticed the fine concentric rings of yearly growth. 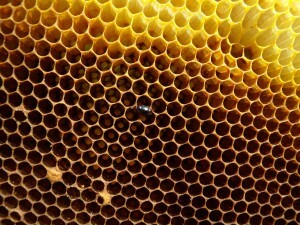 Out of curiosity, I counted the rings, using a magnifying glass to distinguish the tiny lines. Turns out our fig tree is over 120 years old. I counted about 113 rings before, at a quarter inch from the outside edge of the branch, they truly became too tiny to distinguish. Who knows how much older the tree is. Even with a conservative estimate of 120 years, that puts the planting date at 1892, nearly 30 years before our house was built in 1919. How did the tree get here? What else was growing on the land that is now our garden? I find these questions tantalizing, even as I recognize that there is no way to know for sure. So much information is lost in just a hundred years. I can’t know the lives of the people who came before us here. I can’t know what knowledge they took to the grave. What was common sense for one generation can be almost completely unknown a few generations down the line, made obsolete by technological “advances” and changes in lifestyle. My grandmother was the fastest prune plum picker in her family. I have never picked a prune plum, let alone for a living, and don’t know that I would recognize one if I saw it. With all the recent talk about the release of the 1940 census records, I got online last week and did a little poking around. I know a fair amount about my own recent family history. What I was more interested in was the history of our house and garden. In the scheme of things, census records don’t yield much. I can’t know whether the former inhabitants of this house grew vegetables or kept chickens, and I can’t hear their life stories. Still, seeing the handwritten names of the first owners of our house sent chills through me, and subsequently discovering the 1931 newspaper obituary for Lillian, the house’s first matriarch, brought me into a collision between a strange sense of intimacy and dissociation. I think of this house, this garden, this life, as mine, and my place in them as stable and certain. But gardens, whether wild or tended, have always grown here, and animals and people before us have made homes. The poet Mary Oliver asks, “[W]hat is it you plan to do/ with your one wild and precious life?” I will keep seeking my earthly heaven among growing things.